We’ll be recapping every episode of Outlander this season, both in blog post AND podcast. Kendra and Sarah will be focusing mostly on the costumes — designed by Terry Dresbach — in our blog posts, but probably tackling both the costumes and the story itself in our podcasts. You can find the podcast at the bottom of this post, or on iTunes! 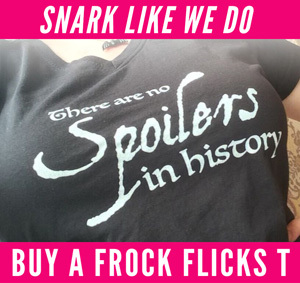 For those who aren’t regular Frock Flicks readers: this blog and podcast is all about costumes in historical movies and TV shows, and we approach things from the angle of history. 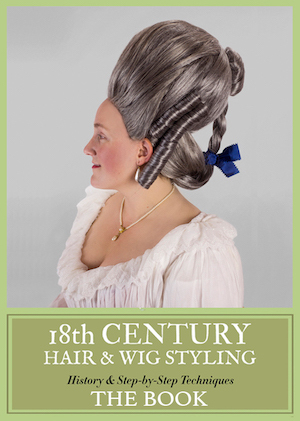 So, expect us to be talking about the costumes primarily from the point of view of comparison with the real history of the 1740s. We’ll also talk about costume in terms of story, and the deviations that come with this one having the fantasy element of time travel. But, know that when we talk about that dreaded phrase “historical accuracy,” we’re not doing it to be mean or judgy. It’s just one lens through which to watch this fabulous show. The Scottish military leaders can’t decide on which course of action to take. Prince Charles Edward Stuart by William Mosman, about 1750. National Galleries Scotland. Angus and Rupert harass some of the Scottish recruits, while Dougal decides to check out the bog in between the Scottish and English troops. Claire is busy prepping the field hospital for the inevitable wounded. A local Scot turns up with a secret route through the bog, which will allow the Scots to surprise the English. The Scots win the battle with very few losses. Claire takes care of the wounded, including Rupert (who we worry about) and Angus (who seems fine) — and finally Jamie shows up. Angus dies, and it is tragic. Dougal gets in trouble with Bonnie Prince Charlie for his bloodthirstiness. Thanks to Outlander Online for the screencaps! Listen to our podcast recap of episodes 9 and 10 here or on iTunes! I know your tongue is firmly planted in your cheek when describing the ‘poncy’ BPC ensemble, but you have to applaud Ms Dresbach and her team for recreating the portrait. One of the reasons I love the period clothes is that the men were dressed with embroidery, beautiful fabrics and even at times surpassed the women’s look. I especially loved Lord General’s look. He’s Scots, a general, a lord and rich. His dress was a perfect indicator of this. But I really was inspired by Dougal leading the troops on horses. Very kingly. In the same way, Henry V was on horseback at Agincourt. Gosh, think what it would mean if Dougal was BCP and actually won at the later battle of Culloden. Watching the episode with Claire in her MASH treating the wounded reminded me of a Georgian M.A.S.H. unit. She owned it. I really thought that the other nurses were from various classes. More kiddos to the costumers. Finally, I agree Fergus’s eyelashes are wasted on him. But he’s sooo adorable. We weren’t being tongue-in-cheek about BPC — what I was trying to say was that his overkill tartan outfit with gold lace and fluffy cuffs is so far removed from what the real Scots are wearing, and it shows how he’s overkilling it trying to be all Team Scot when he’d never been in Scotland before in his life. Oops, my bad. I understand that Chuck only just arrived in Scotland for the first time. I was trying to convey that 1) Ms Dresbach and team did an excellent job recreating the portrait. 2) How although over the top Charlie’s tartan ‘suit’ was, it was still part of his charismatic self & how much men’s fashion has changed. The shield is called a targe in old Scotland. It is VERY appropriate. The size is perfect. And I loved the variety of clothing on all the Scots. You get the idea that not everyone wore up to date styles. They wore what they had. Is Charles Stuart’s gold trim embroidered or is it gold needle lace that has been appliqued, I wonder? I THINK it’s needle lace made from passing thread or twist or something similar, but can’t quite tell. I hate making needle lace with a passion. yes, that’s what I thought, too. Thanks! Cah tree nah Balf No e sound at the end. The foggy battle scene was filmed in a tent. Angus and Rupert. Angus wasn’t suppose to die, but the actor who played Willie (the guy they were going to kill off) was unavailable. Roman is 14 in real life. Fergus is 10. And to let you Diana Galbaldon wrote ep 211. The English soldier was in a couple of Season One episodes, notably when he comes across Claire and Dougal together in the Highlands. He had been charged with bringing her to Fort William to determine her status (as spy or captive or guest of the MacKenzies). He He was polite and respectful, if a bit condescending; the kind of soldier very sure of his superiority. He was quite handsome in his uniform, then. I guess I should have expected Dougal to kill him, but it still shocked me. The man has no scruples. Right! Thank for the reminder about that being dad’s coat! The poem ‘Tam o Shanter’ wasn’t published until 1791, so what they’re wearing in the 1740s aren’t properly TOSs. Calling them bonnets is great, though. Regarding Claire’s Jumps with the crossover design: totally agree with your assessment. Also, they are reminiscent of the modern surplice style neckline commonly seen on women’s scrubs worn by nurses/ppl in the medical field today….made me think of them immediately. This may not have been the design intent, but (for me) it adds to the time-travel element, which makes anything possible :) Thank you, Ladies! I don’t suppose they owned a lot of shirts or packed many for traveling with the army. How did they get the bloodstains out back in those days? Probably with very cold water. Just a guess, but it works well. The shield looks pretty accurate. I don’t know if they were doing this much in the show, but shields were actually used offensively when they were brought into battle. (In Europe) The goal was to bash your enemy’s sword out of the way so you could stab him. Actual sword on sword fighting was avoided because it damaged the blade. Bonnie Prince Charlie is wearing a very modern, Alexander McQueen designed, tartan. Most 18th century tartans I’ve seen at Scottish museums were more orangey, less deep red, that portrait included. My guess were the pigments available at the time? Other than that, the costume is spot on! The “name that tartan” one, looks more like (one of the) the real Fraser tartan, although at the time there was no such designation, so it’s really not important. That’s a 19th century Romantic thing. And please, stop calling it “plaid”.